The Yarn Story focuses on fine fabric and works on rendering it into decor and fashion accessories. 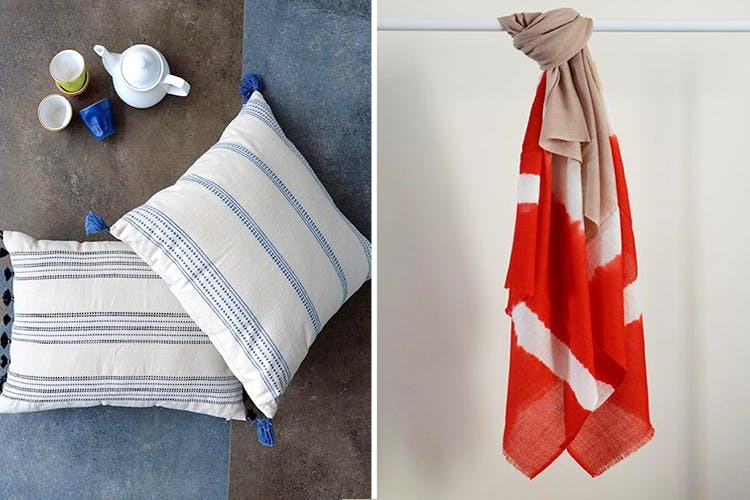 Everything they create is contemporary in look and feel, and made from handwoven textiles. This lends understated elegance to their summer stoles, pocket squares, travel pouches and bed linen. There’s something deeply comforting about natural fibre stoles wound around our necks on a cool evening, or having our head rest against a soft, fluffy cushion that’s so inconspicuous that it always lies hidden somewhere. Oh, and the joy of seeing a cotton throw that reminds us of the little joys of adulthood (green tea, Netflix and a Houndstooth throw FTW). We dig their products for they don't believe in making a grand entry, but just blending in. Just look at their gorgeous throws and scarves, and you’ll know what we mean. We’re told that they take pride in being ‘made in India’ and are inspired by art and travel. This lends a timeless appeal to everything that comes out of their collection. They also follow the farm-to-factory approach, and are sensitive enough to work with brands that follow ethical labour practices. These little things add up, right? Their Merino Wool scarves, starting at INR 2k and pocket squares (in pure silk and funky prints like cars and paisleys) make for great gifts. Oh, and these specially-wrapped presents come in eco-friendly packaging.